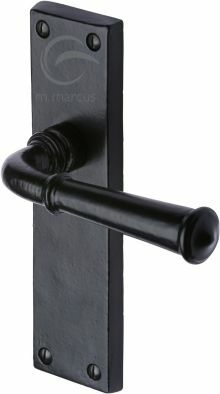 Marcus smooth black iron Ashfield door handles, with the deep surface indentations found in traditional black ironmongery removed. Leaving only the natural surface grains to create a rustic yet smoother contemporary appearance. Supplied in pairs with follower bar and fixings. Backplate size 178mm x 48mm, projection 64mm.